The FLOWATCH portable flowmeter is a versatile instrument designed for simple and accurate measurement of air and water flow. This competitively priced instrument (flowmeter - thermometer) has been developed for use under challenging circumstances. Because of its different impellers, you can use it to measure amost any liquid or gaseous medium. 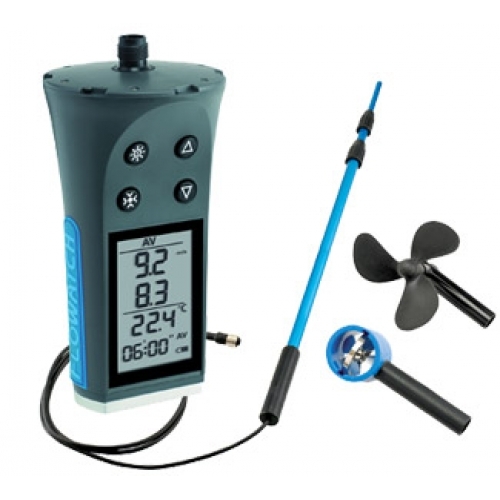 The standard FLOWATCH kit comes complete with a display, 1.2 meter telescoping rod, carrying case and two flow sensors; one for water and one for air. Additional sensors are available, including a hanging water sensor with 15 meter cable.